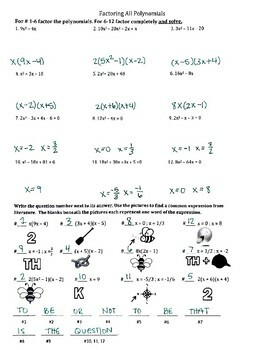 In this worksheet, students will factor and solve 12 polynomials (a mix of GCF, grouping, and trinomials). Then, they'll match their answer to a picture, which spells/sounds out the phrase "To be or not to be, that is the question." 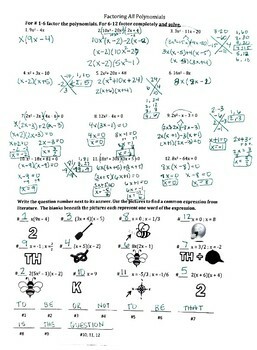 Not only is this a mixed practice, but it also allows students to immediately see if their answer is correct without giving it away. Once all the problems are solved, there's an additional puzzle for those who would like the challenge. Included with this purchase is a worked out answer key as well as just the answers. I hope you and your students enjoy!